I could feel myself getting choked up as I watched Khizr and Ghazala Khan address the Democratic National Convention last month. And when Mr. Khan — a distinguished man of the Muslim faith — described how his U.S. Army captain son sacrificed his life to save his men and how his son represented “the best of America,” the tears started streaming down my cheeks. What I was thinking at that moment was how Mr. Khan was giving voice to what my grandparents might have thought and said 72 years ago while being handed the American flag for the death of their eldest son, Staff Sergeant Francis “Bako” Kinoshita, who was killed in action while fighting in Italy with the 100th Battalion of the 442nd Regimental Combat Team. I also thought how difficult it must have been for my grandparents to have to accept the flag while on a dusty field in an American concentration camp, incarcerated because they were suspected of not being loyal enough to the country their son fought and died for. Only a couple of years earlier my Uncle Bako was a popular, good-looking teenager who loved to play football, did reasonably well in school and in his free time roamed the streets of Seattle’s Central District with his buddies. I never had the chance to talk with him, but I’m pretty sure it was painful when the only country he knew, the United States, started seeing him as the enemy. Sure, his parents were from Japan, and Japan attacked Pearl Harbor, but his dad had been in Seattle for 30 years and his mom had been there for 23. Seattle was their home. They wanted to become U.S. citizens but discriminatory immigration laws in place until 1952 prevented all Japanese from becoming naturalized citizens. A few months after the bombing of Pearl Harbor, Bako, along with 110,000 other Japanese Americans, was ordered to leave his home and go to a street corner to be picked up and taken to the hastily constructed detention center at the Puyallup Fairgrounds. Even though Bako was born in Seattle and knew he should have rights as a U.S. citizen, he was imprisoned without trial or any accusation of having committed a crime. The only thing he was guilty of was his ancestry. After several months at Puyallup, Bako and about 9,000 other Japanese Americans were transferred to the Minidoka, Idaho concentration camp, where dust storms, bad food, and lots of waiting around were common. Although rejected by his country, Bako remained loyal to the U.S. and he volunteered to fight in the Army. When he took his Army physical, he failed because his kidneys weren’t working properly. Disappointed, he returned to the barracks where his family lived and his mother, seeing his disappointment, made a special herbal remedy to strengthen her son’s kidneys. With this homebrew treatment, Bako passed his physical and was soon off to basic training and then off to the war in Europe. It was on a battlefield north of Rome when a sniper’s bullet ended his life. When I ask my mother about her older brother, she still tears up at the memory of hearing about Bako’s death. Bako’s younger brother, my Uncle Chuck, was told of Bako’s death while on farm work leave from the concentration camp and a family friend told me that Chuck collapsed, overcome with despair when news reached him. But who I think about most are my grandparents and the unimaginable pain they must have felt to have lost their treasured son. 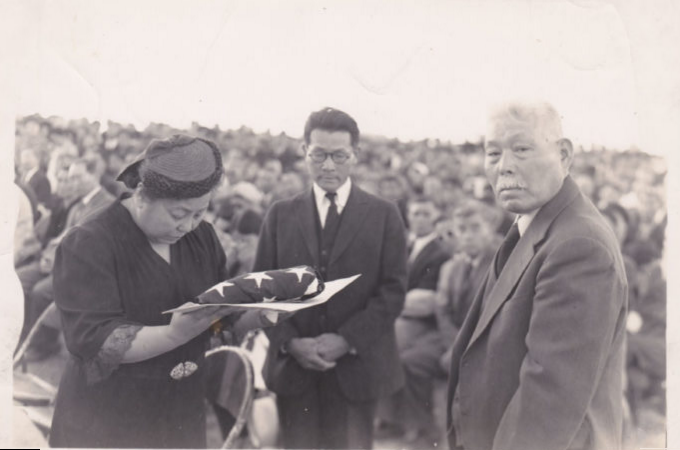 It must have taken so much strength and conviction for them to have been treated so badly and sacrificed so much, and yet be one of the first Japanese to apply for U.S. citizenship when the law finally changed in 1952. When I go to schools to talk, I pose the question, “What does an American look like?” After a lively exchange, I show the class the photograph of my grandparents accepting the flag and tell them that this is what an American looks like. Mr. Khan’s words spoke deeply to me because his experience felt so familiar to my own family history. It’s a cruel reality to be an immigrant who has sacrificed so much for a life in a country that sees you as the enemy because of your race or religion. I admire the Khans for their brave and earnest words, both at the Democratic National Convention and in their responses to attacks from Donald Trump in its aftermath. I thank them for giving voice to the experience of immigrant parents of military casualties, and I stand with many others in the belief that they, and all Gold Star families, deserve nothing but respect. Tom Ikeda is executive director of Seattle-based Densho. Opinions expressed in Vox Populi are not necessarily those of The Rafu Shimpo.